Book Now - Only a Few Choice Summer Weeks Remaining! Half-Duplex house in Key Colony. 3BR-2BA. 1600 sq ft overlooking wide canal. Key Colony Beach waterfront, ocean-side home located on 10th Street with direct access to ocean and bay via Vaca Cut with 37.5-foot dock. Equipped to accommodate up to 30ft boats with dockside electric, water, dock guards, and cleats. Large (1600 square feet), ground level, one-half duplex with one-car garage. Desirable East facing location. Beautifully furnished with Lexington's Tommy Bahama furniture. MEMBERSHIP IN CABANA CLUB which includes use of oceanfront heated pool, sandy beach, and snack/tiki bar all are a short walk. Needs nothing, just bring your luggage. Tennis courts, golf, basketball court, and children playground all nearby. AREA: Miami and Fort Lauderdale Airports are just two hours away. One hour to Key West sunsets and from this prime location in the joy beautiful Florida Keys. We love islands, fishing, beaches, and seafood. The Florida Keys have all of this and more. In 2005 we found vacation home paradise in Key Colony Beach. We adore this community because its quiet and offers all the amenities of a small town. The little post office and shops are quaint and friendly. And, best of all, Key Colony is close to other major islands....Key West, Islamorda, Key Largo for more sun and fun. We love go to Sparky's grill and bar (try the Mahi tacos!) for Happy Hour or dinner after a long day of fishing! The Stuffed Pig is one of our favorite breakfast joints. We also enjoy family walks around the island, to watch the sunset, and along the scenic Seven Mile bridge. Key West is an easy drive but, if it's during holiday season, be sure to allow yourself extra time for the traffic. Keep your eyes out for lots of wildlife! We often see large iguanas, manatees, sea turtles, dolphins, and many beautiful birds. Double sinks and vanity in with full shower in masterbath. Full tub and shower in second bathroom. 100' wide clear canal that is 5 minutes by boat to either the Atlantic Ocean or Florida Bay. Entrance to Florida Bay is through Vaca Cut bridge. Our garage can accommodate a small sedan. High Speed Comcast WiFi and internet. We do not supply beach/swimming towels. Both cubed and crushed ice with water dispenser. Cooks will love this spacious and fully equipped kitchen. Always well supplied with quality pots/pans, utensils, and storage containers. Microwave, blender, toaster and coffee maker. TV's are available in each bedroom and in the main living area. Main TV has DVD player. Table and chairs for seating up to 6. Table umbrella included. Membership to The Cabana Club on Ocean Drive included. Olympic pool, spa, and beach with loungers. Amenities, King-Size Canopy Bed in Master Bedroom with Cable TV and Private Bath, Queen size in Second Bedroom with TV, 2 Full Size beds in 3rd bedroom with Pocket Doors, Living Room, new leather sofa and love seat, Linens, Towels, and Fully-Equipped Kitchen with the Cookware and Dinnerware, Ceiling Fans in All Rooms, Central Air Conditioning/Heat, Laundry located adjacent to Kitchen with Full-Size Washer and Dryer, 46-inch flat screen TV with Sony DVD/CD Player in Living Room, Outdoor Furniture, Table with Six Chairs, Lounge Chairs, and Weber Gas Grill, There is an absolutely NO Smoking or Pets in the Home!, Hi-Speed Internet Included. Meh. It was ok when the ac worked and the ants stayed away. The house was clean so that was nice. Grill was left filthy and with no propane so we borrowed propane from the neighbor and gave him $35 worth of ballyhoo bait in exchange for using it twice. He complained to the owner that I didn’t also replace the gas so the owner charged us $20 for it without even asking me what happened. Also the neighbors happy dog was annoying and they let it run wild on our side of the fence. AC went out Saturday and it was 86 degrees in the house when it was “fixed.” Never cooled less than 77 after. Huge ants present in the house and couldn’t find where they were coming from. I asked to add an additional night and was told there is an “extra charge for having six people” despite the fact that the rental is listed for six people and I didn’t pay an extra charge to begin with, so I had to pay an extra $20 on the last night when they hadn’t charged for extra people previously. The owner offered to refund one night (without the extra person charge and minus the $20 for propane) for the AC issue and that didn’t even cover our stay at a hotel for when the AC was broken. Also- it is advertised as “bring just your luggage” but we had to purchase dish detergent, trash bags, toilet paper, paper towels, and laundry detergent. We never could find a broom or dust pan so we couldn’t sweep all week, which was annoying. I won’t be renting from them again and I hope to never hear from them. This tenant was provided with all details regarding the rental - including propane usage and supplies provided - in the lease agreement. It was unfortunate that the AC unit went out. To accommodate the guests inconvenience we reimbursed her for one night's hotel stay while the AC was being repaired. We use Truly Nolan as our pest vendor and would have called them out immediately to address the issue but the tenant never voiced concern to us regarding ants. We were surprised to receive this negative review as our history of five star reviews indicates otherwise. Great location on Marathon. Wouldn't have changed a thing with the house. Well appointed, bright, open and plenty of room. It was nice having access to the pool, beach and Sunset Beach in the Key Colony community. Everything you need is nearby. Appreciate the hospitality of the owner, manager, and neighbors. Great stay, highly recommend it. Wonderful stay in the Key's!! This house has everything a perfect vacation needs. The space was bright, clean, well-equipped and beautifully decorated. The patio over-looking the canal is spacious and great for outside dinners, lunches or breakfasts. The next door neighbours were kind and respectful. Overall, a great place to spend a vacation! Thank you! 6 of us stayed here for the week. 3 adults and 3 children. The home was perfect for us. Plenty of room. The home is well updated and had everything we needed. We’ve stayed in many rentals in key colony over the years, all have been great. This one seemed to be a notch above the rest!! If you’re having trouble deciding which rental to choose, book this one!! You won’t be disappointed!! This place is very nice, comfortable and looks brand new inside and out. The beds and sofa were all comfortable. The kitchen had every utensil one could ever need, pots, pans and even Tupperware. The dock was brand new with 2 water hoses coiled at each end of the dock. The only thing that I did not like was the fact that there was no where to put your boat if you wanted to pull it out of the water the day before departure to clean it up and get an early start on the road. Other than that the place worked out very well for our vacation and will probably be back next year if possible. Palm Paradise I is a great place to take a vacation. We had family and friends visit during our two weeks. The house is lovely, the furniture is really attractive and comfortable. The kitchen had everything you would ever need and then some. This is our 5th visit to The Keys, Palm Paradise I was hands down the best place we have stayed. We also love Key Colony Beach, we utilized the pool and the cabana several times and it was a great end to a day on the water. We would definitely return to this property. 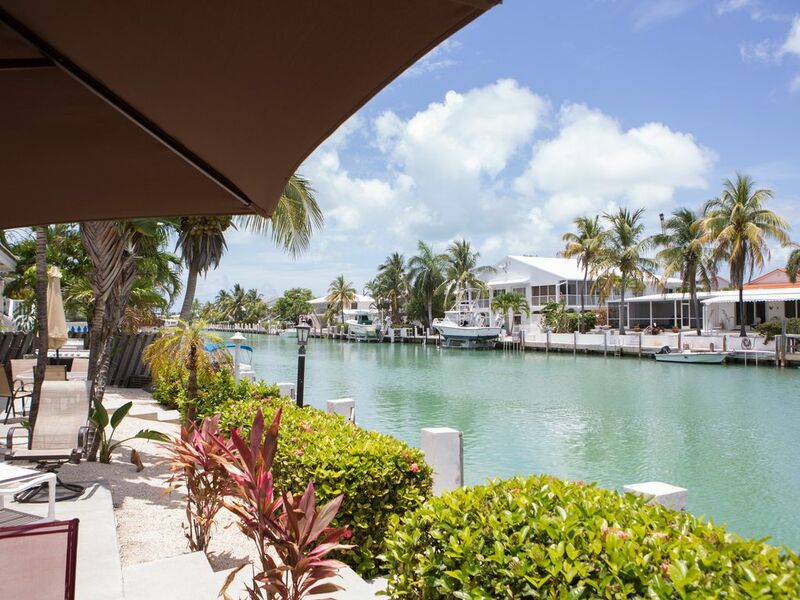 Conveniently located in the heart of the Florida Keys, Key Colony Beach is a private and incorporated community. With it's own Post Office, City Hall, and Police Department you can feel safe and secure in this vacation paradise. Excellent restaurants are within walking distance or if you want to venture by car you can explore the plethora of Florida Keys dining throughout the many islands. On your way to Key West for a day trip, traverse the infamous Seven Mile Bridge with panoramic views and stop in the many small island communities to get acquainted with the people and the Keys lifestyle. If you like to fish but don't have a boat, visit the Key Colony Marina to rent a boat or venture to Cap'n Hooks for an offshore Party Boat and fish the Hawk Channel. Many fish specifies abound in the waters that surround Key Colony Beach. They include such outstanding table fare as; Tuna, Mahi-Mahi, Grouper, Mackeral, and Snapper. If Flats Fishing with a spinner or fly reel is your game, make reservations with Cap'n Scott Yetter at www.sightfishfloridakeys.com. Catch and release or cook your favorite plate on our Weber gas grill. If you just want to relax, be our guest at The Cabana Club on Ocean Drive where you can play in the sand, swim in the ocean, or lounge by the pool and sip your favorite beverage. After fun in the sun take in a movie or experience some very good local talent in action at the Marathon Community Theatre. Shop the local stores for your favorite island attire and stock your pantry with groceries from Winn-Dixie or Publix in Marathon. But, if you just want to relax, enjoy the comforts of our well maintained home....we make sure it stays that way because it is also our personal vacation home since 2005.